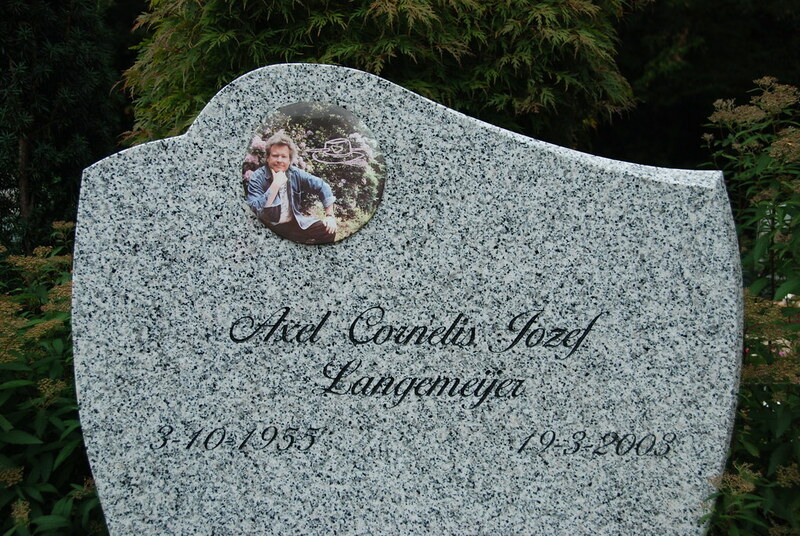 Axel Jozef Langemeijer (birth name) lived in Bussum and was remotely related to Arjen Lucassen, whose family had roots in Hilversum. Only after they both joined the band, they found out that they shared a couple of cousins. 1981 March 25; Muziekkrant Oor: Axel joining BlueskinPrior to Bodine, Axel had been singing in bands named Screwdriver, De Hufters and Blue Skin. According to a news flash in Muziekkrant Oor, he joined the latter band about nine months before he was invited to join Bodine. Langemeijer joined Bodine in January 1982. The story about the Bodine and Axel getting in touch was told by Han Hijzelendoorn of the fan club, who was present when they were introduced to each other. Late 1981, a national fanclub convention took place somewhere in the middle of the country. Many heavy metal fanclubs were represented and the initiators of the Bodine fanclub, Marcel Rijsdijk and Han Hijzelendoorn, were invited too. They just had the first issue of the fan magazine out, a couple of samples of which they took along with them. Band members Gerard, Armand and Rheno came along as well. Bodine was one of the few bands represented by original band members that day. Also present were a couple of representatives from Podia, a company that had mixing panels, speakers and other concert gear for hire. Bodine had already rented Podia gear on a couple of occasions, so they knew each other. One of Podia's employees was Axel Langemeijer. He used to help building up stages and do sound checks as well. One of Podia's owners, Paul Smeehuijzen, introduced Axel to Gerard, Armand and Rheno, who took interest in him. There may have been a starting sense of urgency, since Jay van Feggelen was let go a week earlier. Axel was invited to audition to Bodine. Axel's voice was probably a high baritone or a tenor. He was a kind of singer who, apart from the lyrics, would not control himself and filled his singing with growls, howls, yells, laughs and screams. Besides he had a distinct sob in his voice. Philippe Bascou, a journalist from the French magazine Enfer, wrote that Axel's s singing on 'Black Star Rising' at the Earthquake Festival 1984 reminded him of Marvin Gaye. This indicates that the man had soul as well. The metal singer who is probably closest to Axel's voice is Ronnie Atkins of Pretty Maids--especially in the screams. Axel was more a metal singer than a blues rock singer, though he definitely had a blues feel--"Heavy Metal Heart" is a good example of this and the composition suits his voice excellently. One might conclude that Axel used his voice as an instrument, sometimes cutting edges on articulation and pronunciation. Mainly on Bold as Brass it is not always easy to understand the lyrics--"Aragorn" being the best example. According to the credits on the albums, Axel Langemeijer did not have a major role in writing lyrics. In Axel’s period with Bodine, lyric themes shifted to darker topics and mystical events. Arjen Lucassen admitted to be major contributor to this tendency. Nonetheless, Axel seemed to be comfortable with what Arjen wrote for him. At the same time, Axel improvised the lyrics on stage without hesitation. This underlines his musical skill. 'Regular Rocker' was both performed by Axel and Jay and gives us a revealing insight in style and approach of both singers. It is quite unique to be in this circumstance--taking into account that Bodine's recording years only lasted three years. After Bodine, Axel Langemeijer picked up a career in graphic design. He sadly died on 19 March 2003.